The Band Perry — The Cube Experience — Absorb. ABSORB. and THE BAND PERRY have collaborated on multiple groundbreaking film, production design, and visual arts concepts. 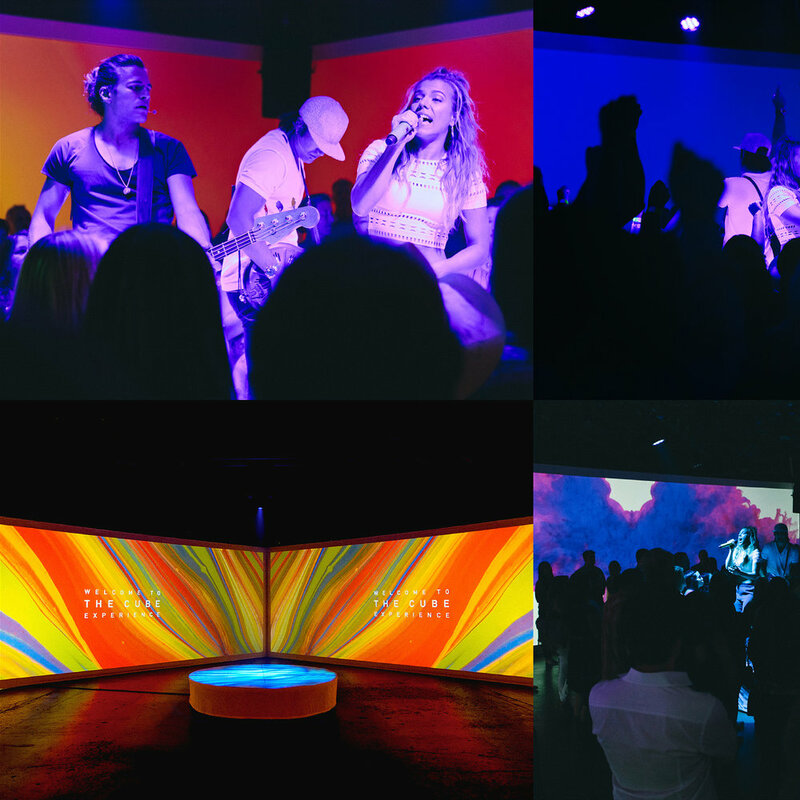 Among the most exciting was our 2015-2016 immersive performance structure called THE BAND PERRY: THE CUBE EXPERIENCE, which provided VIP fans with a premium, multisensory, and close-proximity-to-artist performance space unlike anything they've ever experienced. TBP are truly adventurous artists, and we love working with them on big ideas like this. Each 30x11" wall of the structure is built of double-sided projection material, capable of bearing progressive digital content via exterior HD 35k lumen LCD projectors. 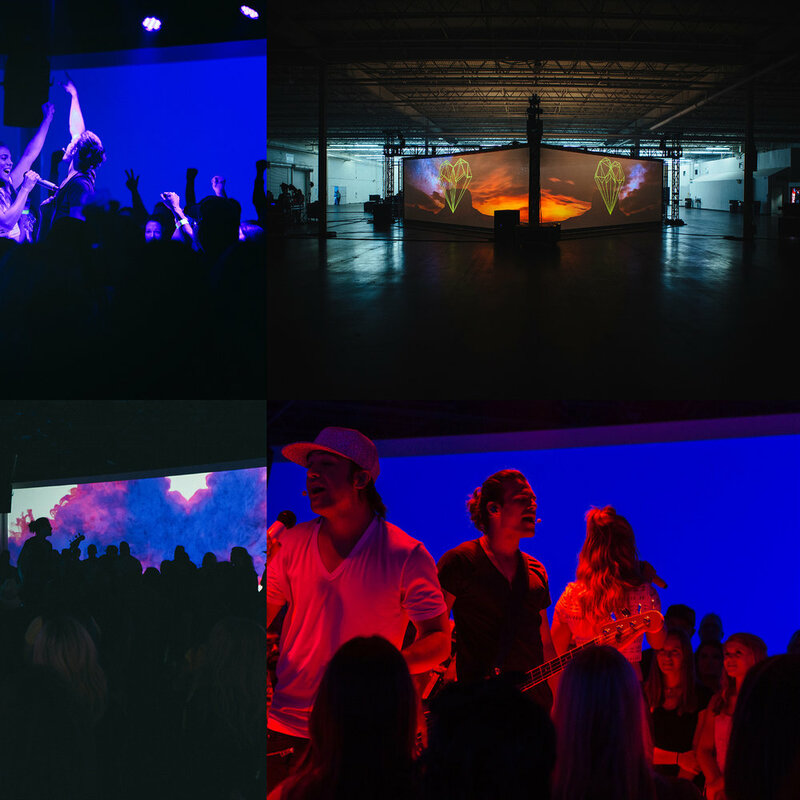 Screens content is built, programmed, and mapped specifically to each song performed in the structure, with highly rhythmic and dynamic properties completely surrounding the audience in sound and visuals, and allowing fans to actually “see” and “feel” the music as the artist performs on a centralized circular stage. THE CUBE was also featured in The Band Perry's fall 2015 music video for their single, "Live Forever." Fans and industry alike raved over THE CUBE EXPERIENCE, and MIX Magazine praised the endeavor for "forging new ground" in the world of live entertainment. We are proud to be working on cutting-edge new experience mechanisms like this one, ushering in a whole new era of excellent, immersive performance concepts for audiences of all sizes. THE CUBE EXPERIENCE STRUCTURE DESIGN OWEN THOMAS. THE CUBE EXPERIENCE AUDIO DESIGN VUE AUDIOTECHNIK.